Millions of tiny baby King salmon are growing at Petersburg’s hatchery in brand new equipment. After the Crystal Lake Hatchery’s incubators and generator shed were destroyed in a fire in March of 2014 the facility was rebuilt with new technology. It’s helping to fine tune the fish rearing process. The fire raged through the early morning hours on March 3. Located 18 miles south of Petersburg, the facility was just too far away for responders to stop the flames. The hatchery’s main incubation area burned. Over a million King eggs were lost. Now, over a year later, a new facility stands in its place. Loren Thompson is the manager at the Crystal Lake Hatchery. He’s been working here for 15 years for the Southern Southeast Regional Aquaculture Association or SSRAA. The association operates the facility but the state owns it. The old wall heater was suspected as the source of the fire. But it wasn’t just the wall heater that was dated. Thompson shows me into the main building where we are met with the buzz of new technology. They couldn’t replace the equipment with the same 30-year-old machinery because it’s not made anymore. But it could be a blessing in disguise. “Even the cost of running things, everything is so much more efficient now,” Thompson said. The new equipment is all about control. Thompson points to the hatchery incubators where the eggs are right now. 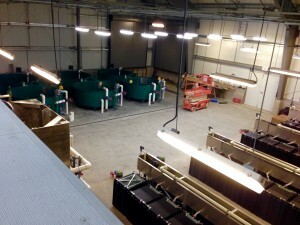 The system controls the environment to grow the salmon eggs the way you want. If they let the eggs go at 16 degrees for example? The little fry could then enter a world of warmer spring water spurring them to eat and grow well. Hatchery workers know when the fry are ready to come out of the incubators by how much their yolk sacs weigh. The yolk sacs are attached to their body and when that equals six percent of their body weight, it’s time to move to a bigger tank. The workers keep close tabs on the fish by doing test weights every week. Thompson and I walk over to six large green tubs on the other side of the incubation shed. The water is filtered, heated, re-oxygenated. It’s basically tricking the fish into growing a certain way. This kind of accuracy is important. It’s technical control that will help trouble shoot any potential problems mother nature throws out. Say for example weather gets unseasonable cold like it did some winters ago. New technology is not without its problems. As Thompson points out, it comes with equipment that must be maintained. But if all things go according to plans the eggs in the incubators will eventually grow into strong healthy smolt which will be released from the hatchery in the spring of 2017.